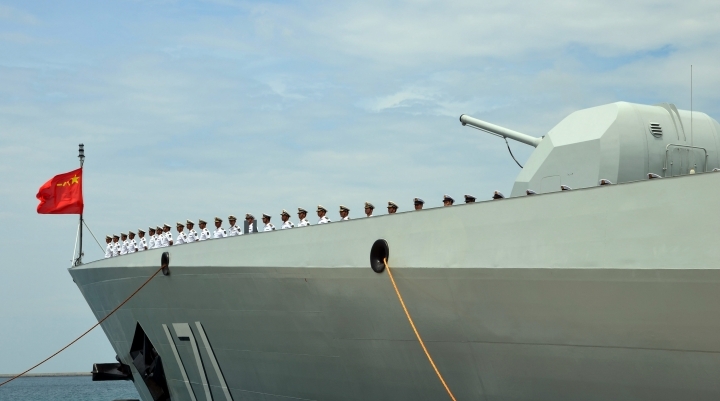 EDITOR'S NOTE: This is a weekly look at the latest developments in the South China Sea, home to several territorial conflicts that have raised tensions in the region. The U.S. Navy is planning a fresh freedom of navigation operation around China's man-made islands, the first under President Donald Trump, the Navy Times reported, citing defense officials. 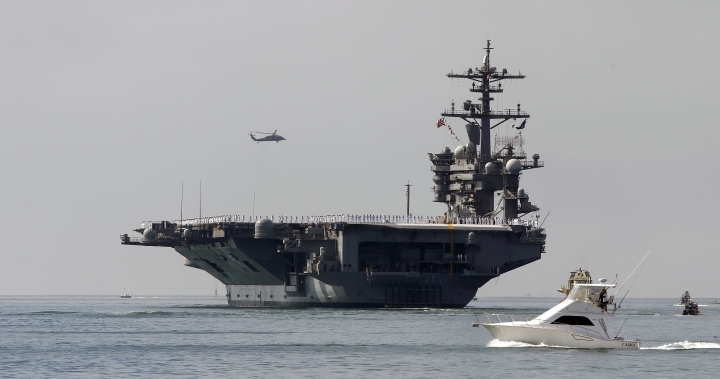 The operation would most likely be carried out by the San Diego-based USS Carl Vinson carrier strike group, which began patrolling the South China Sea on the weekend. It would involve sailing within 12-mile territorial waters of the island features China claims as its own, the report said. According to newspaper, the plans are awaiting Trump's approval. China's Foreign Affairs spokesman Geng Shuang said he was aware of the reports. He said that while China respects freedom of navigation under international law, "we have firm objections to any country that impairs China's sovereignty and security interests in the name of freedom of navigation and overflight." "We urge the U.S. side not to take any actions that challenge China's sovereignty and security, and respect the effort made by regional countries in safeguarding peace and stability in the South China Sea," he told reporters. Navy warships have deliberately sailed close to Chinese-occupied features four times since October 2015, ignoring Beijing's sovereignty claims. The first three missions challenged China's requirement for ships to obtain permission prior to transit, while the last one challenged China's sovereignty over waters encompassing the Paracels. Some criticized the Obama administration for curtailing freedom of navigation operations and allowing China to build military installations on seven artificial islands in the disputed waters. Trump's Defense Secretary Jim Mattis said recently that such operations will continue while also ruling out any military escalation. "Any miscalculation from either side may escalate tensions, which could spin out of control," Zhiqun Zhu, who heads The China Institute at Bucknell University in Pennsylvania, told the Navy Times. "China is unlikely to cave in no matter what the U.S. military does in the South China Sea. Cooler heads are needed from both sides, not moves to unnecessarily provoke the other side."?? Just as the USS Carl Vinson aircraft carrier strike group begins its deployment in the South China Sea and the Western Pacific, China dispatched its own fleet for scheduled drills. The missile destroyers Changsha and Haikou and the supply ship Luomahu wrapped up weeklong exercises on Friday. The fleet includes three helicopters and marines on board. According to the official Xinhua News Agency, the drills involved naval aviation forces and military garrisons from both the Spratlys and the Paracels, as well as elements of the Beihai and Donghai fleets. They practiced air defense, escorting, anti-terror, anti-piracy and defensive operations under real combat conditions, Xinhua said. China is considering revisions in its 1984 maritime law that could bar foreign ships from passing through what it considers Chinese waters and require submersibles to travel on the surface, display national flags and report to Chinese authorities. According to a draft that was published to solicit public opinion, foreign ships that violate Chinese laws would be expelled, state-run media reported. The proposed changes are in line with international maritime law, Beijing media said, but they could also set China up for conflict with Washington, which insists on freedom of navigation. The draft doesn't mention the South China Sea specifically, but China claims the area almost in its entirety. Late last year, China seized an underwater glider that was launched by the USS Bowditch in international waters off the Philippines and returned it after the U.S. protested. "Beijing is seeking to improve its management of maritime security by adding new operational details into law, especially details related to growing threats from foreign close-in surveillance," Lin Yongxin, a senior researcher from the government-affiliated National Institute on South China Sea Studies, told the South China Morning Post. China plans to launch its second and first home-made aircraft carrier this year, military consultants told state-run media. China's military spokesman in January confirmed that the 50,000-ton carrier is being built in the northern port of Dalian and will be conventionally rather than nuclear powered. According to Xu Guangyu, a retired Chinese military officer and consultant to the China Arms Control and Disarmament Association, the carrier will launched later this year and is expected to enter service by 2020. China currently operates one aircraft carrier, the Liaoning, that was purchased as an incomplete hull from Ukraine more than a decade ago and commissioned in 2012. Some 1,000 military and civilian residents of the Chinese-controlled Paracels used to get their tomatoes and spinach delivered by ship. State-run media reported they've now started growing their own vegetables in a greenhouse, ending reliance on the mainland. People's Daily reported a greenhouse covering 567 square meters (6,100 square feet) was built on Drummond Island, known in Chinese as Jinqing Dao. The goal for a weekly yield: 200 kilograms (440 pounds). Recent satellite images of the islands suggest China has upgraded its military facilities in the Paracels, which are also claimed by Vietnam and Taiwan.